We’ve been growing fruit since way back in 1843 when great-great-grandpa Joseph B. Chiles came to the Sacramento Valley (Google it). Five generations later, we started Branch to Box with the mission to bring your office the freshest & tastiest stuff nature has to offer. Recent studies have shown that fruit is healthy – we agree with those studies. 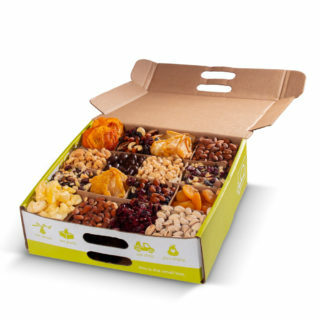 Whether its fresh fruit, dried fruit, or nuts, each box is packed full of healthy and tasty treats from nature. If you’re planning to start an office health initiative, Branch to Box is your answer. Click here to get started, or reach out to chat service@branchtobox.com or call (866) 293-4037. Healthy snacking can be hard – let us make it easy. Each week is a new mix of the best seasonal fruit and healthy snacks – delivered right to your doorstep. Office fruit delivery has never been easier. Simply choose your delivery day and frequency, and let us handle the rest. As for billing, every time we ship your box, we email you (or accounts payable) a receipt. If you’d prefer invoicing we can handle that too. First of all, when you call or email, a real human will answer. That real human will be excited to help you with whatever your needs are. Whether it’s accommodating a nut allergy, changing your delivery day, or even pausing your subscription, our fruit experts are happy to help. Drop us a line at service@branchtobox.com. #5. Bang for your Buck$. Healthy snacking can get pricey – we make affordable tasty servings as low as $1.15 per serving delivered. It’s not just about the money you spend – it’s about the money you save. This Harvard study shows every $1 spent on employee wellness results in a healthcare cost savings of $1.41 (study here). Oh and another thing: Always free delivery. Let’s just be fruit with benefits. No funky contracts that make it impossible to stop your subscription. We make it easy for you to cancel, upgrade, or pause your subscription. Simply shoot an email to service@branchtobox.com or call us at (866) 293-4037. Unlike our competitors, we grow some of our fruit. This allows us to get you the best fruit – from our branch to your box. Even the stuff that we don’t grow, we get from partner growers that we’ve established over the last 5 generations (see #1). Shipping fruit can be a bit tricky – we know this first hand, and that’s why we guarantee each box we send. If for whatever reason you’re unhappy, our Awesome Service people (see #4) will make it right. Everyone likes food in the office. Invest in your employees, by having some healthy brain food from Branch to Box. Boost morale and productivity in one whack. Change the culture of the office by having a fun and interactive box that arrives every week. Your box is packed in a building covered with solar panels (just ask our employees who no longer get cell reception). We also use sustainable farming practices like drip irrigation and integrated pest management. If reasons #1-9 weren’t enough, give us a chance to “wow” you by letting us send you a free sample box. Contact us for the details.